This season, let’s raise the temperature with your summer fundraiser parties. Looking for ways to extend your fundraising efforts into the summer months? There are always ways you can continuously raise money for your child’s school or camp programs all year long, and summer is certainly a great time to do it. With warm weather, it is the ideal time to try out a plethora of summer party ideas. This season, let’s raise the temperature with your summer fundraiser parties. A block party is a fantastic way to invite everyone in your neighborhood to a casual get-together. Since block parties are casual and low-key, neighbors and friends of all ages can enjoy the late spring/early summer air. You can set up games that come with prizes that will support your fundraiser. Summers on the East Coast are famous for being hot and humid. If you have a pool at your home or have the opportunity to rent a neighborhood pool for a night, this would be the perfect opportunity to invite donors to get together and spread your message. Pool parties are appealing to everyone. Kids can swim in the pool while parents chat and get to know each other a little better, all while coming to support your great cause. What kid doesn’t love a friendly water balloon fight in the heat of the summer? 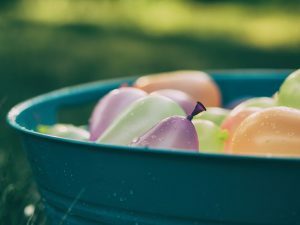 Why not host a friendly water balloon battle in your own backyard as a way to support your cause? Kids will enjoy the classic game while also cooling off after a long day at camp or the pool. Parents can be involved by supervising (and maybe even throwing a water balloon or two themselves). Sometimes, there’s a reason why the basics are best. Hosting a classic backyard barbecue will be a timeless summer way to have potential donors meet each other. You can dress it up or dress it down as much as you’d like. There only needs to be one thing for sure, and that’s barbecue! This entry was posted on Friday, May 25th, 2018 at 11:46 am. Both comments and pings are currently closed.